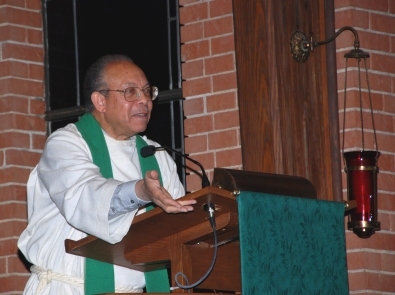 The Resident Bishop of the Illinois Great Rivers Conference spoke Nov. 15 at Alton Main Street UMC to the assembled crowd. "Like God, Jesus was always on time in addressing human needs," Bishop Keaton emphasized. He said, “Ministry with Liberia has ignited the Spirit of giving within the partners of Liberia here in the United States and the rest of the world. You as partners of Liberia can do anything in Liberia with the help of God,” Keaton said. Earlier in the opening service, a letter from Ellen Johnson Sirleaf, President of the Republic of Liberia and member of the United Methodist Church was read during the opening service. In her letter, President Sirleaf praised the partners of Liberia and the people of the Illinois Great River Conference for their respective contributions in helping to develop Liberia. She thanked them for the construction of schools and health centers, especially the new hospital that is about to be built in Ganta, Nimba County. “I pledge my government’s support in every way possible to enhance the work that UMC partners are doing in Liberia,” the letter concluded. Bishop John G. Innis, Resident Bishop of the Liberia Area, United Methodist Church is leading a Liberian delegation to the Liberia Partnership Summit. He is expected to deliver the meditation for today in continuation of the summit now taking place in Alton. The three-day summit brings together partners from Germany, Liberia, and the United States of America. More than 50 participants from all over the United States of America are in attendance. The six agenda items for the summit are: Ganta Hospital, Pastor Salary Support in Liberia, Agriculture, Self Sustainable Projects, Construction Projects, and Training Opportunities. The summit ends Nov. 17. E. Julu Swen is the director of communications for the Liberia Annual Conference of The United Methodist Church.